'Where in parliamentary democracies around the world do political parties drag Supreme Court judges in the middle marches of the night to decide who will rule?' asks Sunil Sethi. The spectacle provided by the Karnataka election's hung verdict would be merely farcical were it not tragic for the practice of democracy. About the only people to emerge running a sensible, lucrative, trade are the resort owners of Bengaluru for housing the newly-elected JD-S and Congress party MLAs, or the security agencies responsible for ensuring that there were no escapees. As usual, Kerala Tourism was on top of the game with its tweet, hastily deleted, that invited legislators to the 'safe and beautiful' resorts of 'God's own country'. For the rest, from instantly sworn-in chief minister B S Yeddyurappa to Governor Vajubhai Vala for giving him two weeks to prove his majority, are Prime Minister Narendra D Modi and BJP president Amit A Shah's "paid agents" openly flouting the rules. Where in parliamentary democracies around the world do political parties drag Supreme Court judges in the middle marches of the night to decide who will rule? Congress MP and counsel Abhishek Singhvi said the mere fact he could get three judges out of bed at 2 am 'is a victory for democracy". To which his opponent, the BJP's Mukul Rohatgi, replied that the only such precedent in his case was when the Supreme Court heard his defence of Yakub Memon in the Mumbai blasts case at an unearthly hour. 'I argued from 2 am to 5 am,' Rohatgi he said as a mark of his legal prowess on a night out. 'And only because Yakub Memon was due to be hanged at 6 am'. Actually, given the background of the unseemly ongoing tug-of-war between the federal court and the BJP government over Justice K M Joseph's elevation, it could be that the three-member bench didn't mind losing a bit of sleep to enjoy a spot of gallows humour in the wee hours. Or perhaps a kind of poetic justice to order Governor Vala to get Mr Yeddyurappa to prove his majority double quick. 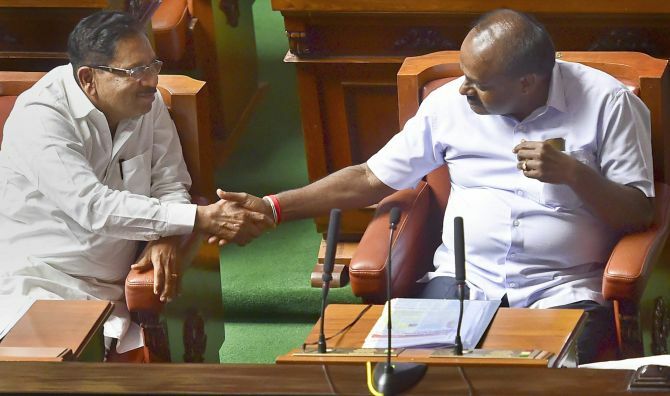 Whichever way the three-legged contest in Karnataka pans out, the new government will be inherently unstable. Even in direct two-party face-offs, as in Gujarat, the fickleness of voters makes for slim pickings. Repeated failures have reduced the Congress to an also-ran party, condemned to playing second fiddle to regional bosses. For the BJP the road to 2019 is no less fraught. It faces anti-incumbency in upcoming elections in Rajasthan and Madhya Pradesh, and is hurting from the loss of two prestige by-election seats in Uttar Pradesh to the SP-BSP combine. Other democracies strain to find solutions. France and Germany have turned cohabiting in ideologically opposed coalitions into an art form. Fractured politics in Britain, Italy and Greece have pushed them into an economic quagmire. India's answer is the buying and selling of elected legislators in an open auction with no reserve price. In Karnataka the JD-S-Congress alleged that BJP bids for MLAs went up to Rs 1 billion plus the blandishment of ministries. The last resort of saving susceptible legislators is to lock them up in resorts. It was alleged that when coalition partners tried to fly out their MLAs on chartered flights the planes were barred from landing. Mr Yeddyurappa's immediate offer after his instant swearing-in was to waive farmers' loans -- an announcement that left government officials stupefied. He was doing this 'off-site' of course -- without so much as stepping into the assembly building to present his flock. In case you are unfamiliar with current jargon, 'off-site' is a phrase used by profitable corporations to hang on to their staff by rewarding them in numerous ways. The commonest off-site practice is to give employees a paid holiday to the fleshpots -- Bali or Bangkok used to be common -- but lately the destinations have become more exotic and include Slovenia and the Aegean islands. It will be no surprise if Indian legislators follow suit. It used to be said that politics was the last resort of scoundrels. Times have changed. Resorts are the new politics of scoundrels.